Today’s guest post is brought to you by Apurva Davé, VP of Marketing at Sysdig, who’ll discuss using Kubernetes metadata & Sysdig to understand what’s going on in your Kubernetes cluster. Sure, metadata is a fancy word. It actually means “data that describes other data.” While that definition isn’t all that helpful, it turns out metadata itself is especially helpful in container environments. When you have any complex system, the availability of metadata helps you sort and process the variety of data coming out of that system, so that you can get to the heart of an issue with less headache. In a Kubernetes environment, metadata can be a crucial tool for organizing and understanding the way containers are orchestrated across your many services, machines, availability zones or (in the future) multiple clouds. This metadata can also be consumed by other services running on top of your Kubernetes system and can help you manage your applications. Labels are not designed to be unique; you can expect any number of objects in your environment to carry the same label, and you can expect that an object could have many labels. What are some examples of labels you might use? Here are just a few. WARNING: Once you start, you might find more than a few ways to use this functionality! In addition to custom labels you might define, Kubernetes also automatically applies labels to your system with useful metadata. Default labels supply key identifying information about your entire Kubernetes hierarchy: Pods, Services, Replication Controllers,and Namespaces. Kubernetes labels allows you to easily move between a “physical” view of your hosts and containers, and a “logical” view of your applications and micro-services. At its core, a platform like Kubernetes is designed to orchestrate the optimal use of underlying physical resources. This is a powerful way to consume private or public cloud resources very efficiently, and sometimes you need to visualize those physical resources. In reality, however, most of the time you care about the performance of the service first and foremost. But in a Kubernetes world, achieving that high utilization means a service’s containers may be scattered all over the place! So how do you actually measure the service’s performance? That’s where the metadata comes in. With Kubernetes metadata, you can create a deep understanding of your service’s performance, regardless of where the underlying containers are physically located. Let’s look at a quick example to make this more concrete: monitoring your application. Let’s work with a small, 3 node deployment running on GKE. For visualizing the environment we’ll use Sysdig Cloud. Here’s a list of the nodes — note the “gke” prepended to the name of each host. We see some basic performance details like CPU, memory and network. Simply scanning this list of containers on a single host, I don’t see much organization to the responsibilities of these objects. For example, some of these containers run Kubernetes services (like kube-ui) and we presume others have to do with the application running (like javaapp.x). This aggregates containers at corresponding levels based on the above labels. In the app UI below, this aggregation and hierarchy are shown in the grey “grouping” bar above the data about our hosts. 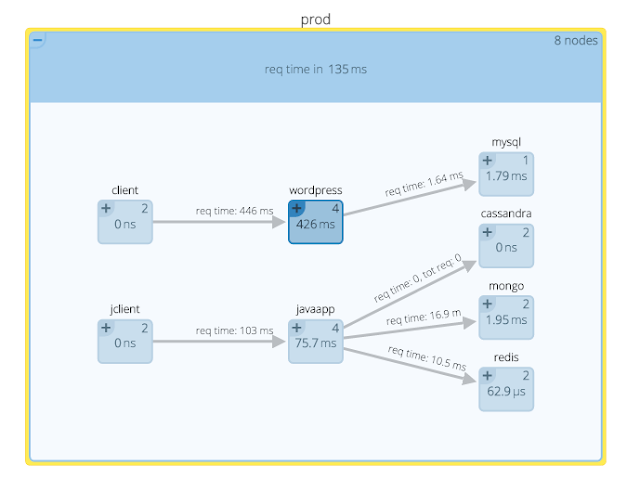 As you can see, we have a “prod” namespace with a group of services (replication controllers) below it. Each of those replication controllers can then consist of multiple pods, which are in turn made up of containers. This is a pretty quick tour of metadata, but I hope it inspires you to spend a little time thinking about the relevance to your own system and how you could leverage it. Here we built a pretty simple example — apps and services — but imagine collecting metadata across your apps, environments, software components and cloud providers. You could quickly assess performance differences across any slice of this infrastructure effectively, all while Kubernetes is efficiently scheduling resource usage. Get started with metadata for visualizing these resources today, and in a followup post we’ll talk about the power of adaptive alerting based on metadata. – Apurva Davé is a closet Kubernetes fanatic, loves data, and oh yeah is also the VP of Marketing at Sysdig.